Learn about the different types of Tripod Sprinklers and let me help you determine if a Tripod Sprinkler is right for your lawn, garden, or plantation. The Sprinkler Head is the part that sprays the water. The Sprinkler Base is the three-legged stand that the Sprinkler Head sits on. The Sprinkler Base is made up of 3 legs. These legs are, often times, adjustable. But not always. First, what is a Tripod Sprinkler? If you don't already know, a Tripod Sprinkler is a sprinkler that stands above ground on 3 legs. The legs can be made of hard plastic, brass, zinc, or even wood. A Heavy Duty Tripod Sprinkler means that the sprinkler head is made of durable, long lasting material. Brass sprinkler heads are the most common Heavy Duty Tripod Sprinklers but that doesn't mean the stand is made of brass, just the sprinkler head (and maybe the tightening ring that joins the hose with the Tripod Sprinkler. But those are almost always brass regardless of what type of sprinkler head you have). Heavy Duty Tripod Sprinklers should be used if the sprinkler will be in a place that experiences harsh weather conditions or other outside forces such as large animals. Heavy Duty Tripod Sprinklers are also supposed to last a lot longer than regularly tripod sprinklers. A brass Orbit tripod sprinkler head is the best sprinkler head for your money because they perform tremendously. 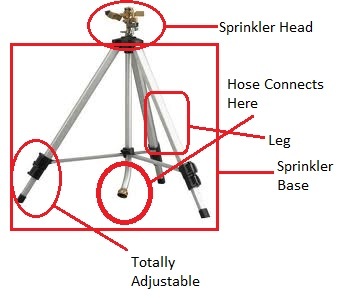 With Tripod sprinklers you are likely to find Impact Sprinklers on Tripod stands that serve the same purpose as any Tripod Sprinkler. These, too, come in many different shapes, sizes, and material. The best ones are going to be made of a strong metal like Zinc or Brass. I believe you can also find some in copper but those are sure to rust. Impact sprinklers on Tripod stands should be used for areas that are more confined than, say, a wide open field. 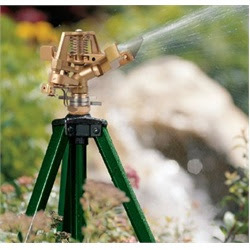 If you want to water a small garden or yard, an impact sprinkler on tripod base will do the job. But if you are wanting to water a large field or medium to large lawn, a standard Tripod Sprinkler is for you. These sprinkler heads can easily be removed from the tripod stand, whereas some Tripod Sprinklers rely on the stand or base to function properly. It is probably in your best interest to acquire an Impact Sprinkler, and then if a stand is needed, get a tripod stand separate from the Sprinkler Head. Read more about Impact Sprinklers on my Pulsating Sprinklers post.